This acrylic gavel set comes in two sizes, 8" gavel or 10" gavel, with a 3" square sounding block. Price includes flexi-brass-colored band with up to 3 lines of engraved text, 20 characters/line. Sounding block may also be engraved for additional cost (priced via quote). This impressive crystal gavel will certainly catch anyone's attention. Hand cut faceted crystal gavel measures 10" long and sits within a black crystal base. Price includes lettered plate on base front. For the ultimate in distinction our genuine walnut wood gavel presentation set is hard to match. 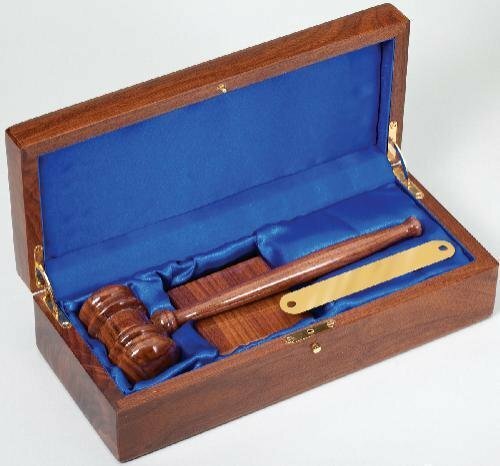 Includes 10" gavel with brass band, 2.5" square sounding block, and satin-lined presentation box with brass hardware. Price includes up to 3 lines of engraved text on band, 20 characters/line. Engraved plate on top of box may also be added for additional cost (priced via quote). 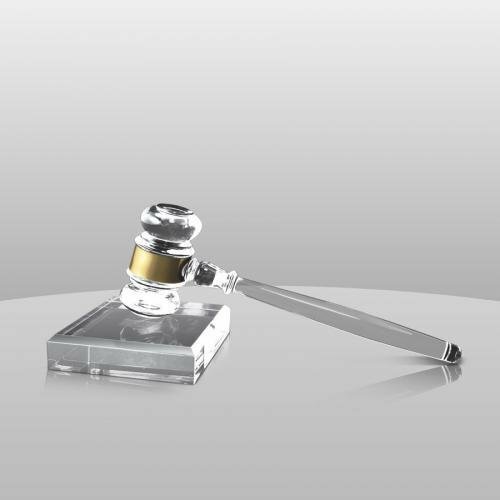 For the ultimate in distinction our high gloss rosewood finish gavel presentation set is hard to match. 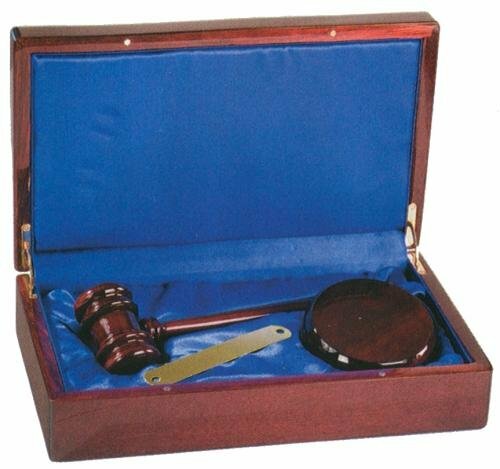 Includes 10" gavel with brass band, 4" round sounding block, and satin-lined presentation box with brass hardware. Price includes up to 3 lines of engraved text on band, 20 characters/line. Engraved plate on top of box may also be added for additional cost (priced via quote). This 11"x3" genuine walnut presentation stand matches well with our 10" genuine walnut gavel (available for separate purchase by clicking here). Use the long, angled face to include verbiage to the recipient or designate the purpose of the gavel (up to 3 lines text, max 60 characters per line included in price). Stand can also double as a sounding block. 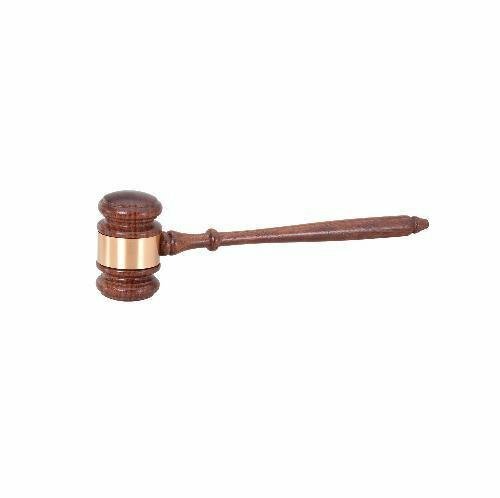 Available in two sizes 8" and 10", our genuine walnut wood gavel is a classic choice for functionality and durability. Price includes brass band with up to 3 lines of engraved text, 20 characters/line. For a gavel with added elegance, we have our 10" rosewood piano finish gavel. Price includes brass band with up to 3 lines of engraved text, 20 characters/line. For a handsome and practical leader's gift, this walnut gavel set is a good choice. Includes 10" genuine walnut gavel, 3" diameter sounding block, and brass band with up to 3 lines of engraved text, 20 characters/line. Sounding block may also be engraved for additional cost (priced via quote).